One of the hardest parts of the ottoman project was figuring out dimensions. 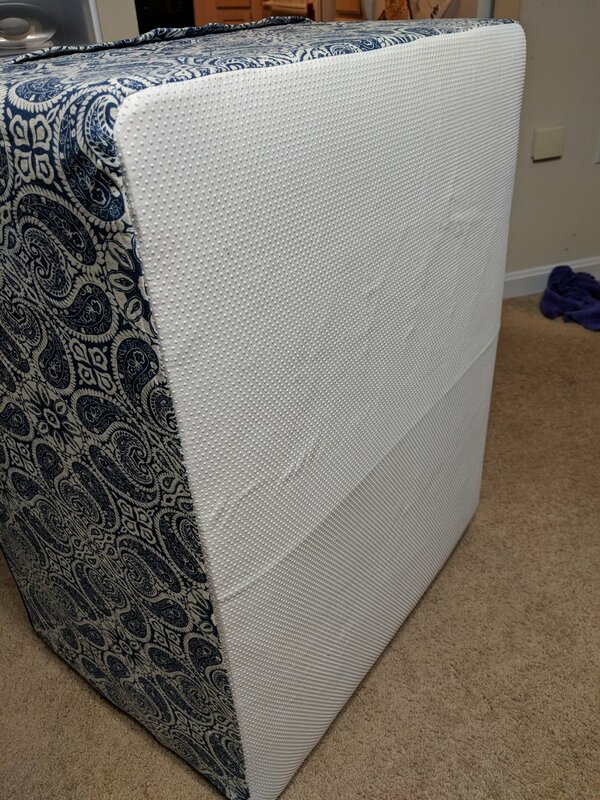 I wanted to be able to easily put the cushions in and take them out, but I didn't want the cover to be loose. I measured the dimensions of the above stack of cushions, and came up with 25"x 31" on the top, and about 19" tall. 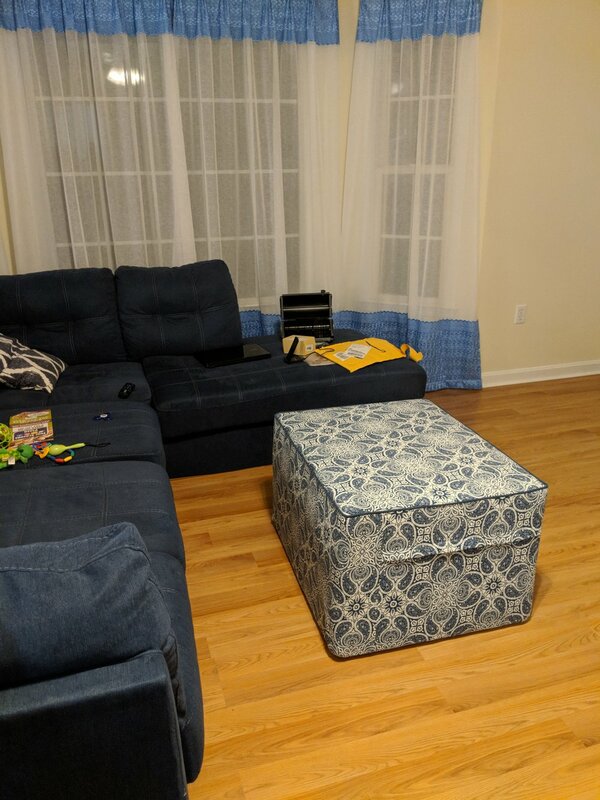 I decided I wanted the cover to compress the height of the cushions, so I sat on the stack and pushed it down and measured, and finally decided to make the height 17". This ended up working great. So I took zero pictures of my process, sorry. I needed to go to the store and buy some more supplies and ended up waiting a few days and sewing some kids clothes. When I came back to the project, I wanted it over! I chose this fabric, which unlike my other fabric choices, is supposed to be dry cleaned. However, I was in love with it, so I bought it. I used 3 yards. I did wash it and it came through just fine. First off, I had to figure out how large to make the gusset. Just like before, I added up the measurement of the cushions, not my fabric piece. So 25+25+31+31=112". For the zipper, I bought two of the 36" zippers I used on the cushions. I decided to use them as one zipper that meets in the middle. So that's 72". That left 40" of gusset. For that part, I cut out a piece of fabric 18"x41". For the zipper panel, I had to do some math, because I wanted to have a lapped zipper. I'm not sure that's the proper name, but you can see above where the zipper is covered. I just guessed at where I wanted the zipper to be. I wanted it higher for ease of getting the cushions in and out, but not at the top. I ended up cutting one piece 12.75" x 73" (don't forget to include seam allowance, mine is 1/2") and one piece 7.25" x 73". A little over 3 yards of piping. After cutting I serged the edges of all the pieces. I took my wider zipper gusset piece and pinned the zippers onto the top edge with the zipper pulls meeting in the middle, right side together. I layered the zipper tape ends on top of each other. Using a 1/4" seam allowance, I sewed on the zipper with a zipper foot and then topstitched the seam. Then I repeated those steps with the top of the gusset, except the topstitching part. Instead, I folded the gusset fabric down to cover the zipper. From the zipper seam it was 3/4" down to the fold. Iron that fold. Then I topstitched about 1" away from the fold. This was the biggest headache of the project, because my layers kept shifting even when I pinned it. I finally turned the fabric and sewed from the back. With the zipper panel all sewn, sew either ends to the other gusset piece, and topstitch those seams. I had enough piping left over to go around the top. See my previous post for details on sewing that on. Actually, go back to that post as well for instructions on sewing the gusset to the top! Before you sew the gusset to the bottom, it should be reinforced. We have laminate floors and I did not want my kids turning this into a sliding toy. So I bought non-slip grip fabric, like you see on the bottom of footie pajamas. (I also prewashed it, because I've had it shrink before). After feeling it, I realized it was a little thin, so I decided to layer it with the fabric. Then, I came up with a great idea. I cut out some double-sided fusible peltex the size of the bottom, minus the seam allowance, because that stuff is too thick to want in the seams. The peltex is only 20" wide so I had to use two pieces. I sandwiched it between the fabric and non slip fabric. I fused it (from the fabric side so I didn't melt the non slip fabric). Then sewed the gusset on it like I sewed the top! Then I realized I had sewn the bottom on in a different direction than the top. I had already sewn on the bottom AND topstitched it. I was so sad! I had to put it down for the night. Seam ripping took forever. One key difference between this and the cushions is that I did decide to topstitch. I topstitched the top and bottom seams on the gusset. Since this cover isn't as tight as the cushions, I wanted those seams stitched down. And it's complete! Zip up those cushions and enjoy. I love mine. It's already a great addition to our family room. I think it was well worth the time and expense, and it turned out perfect. Speaking of the expense, how much was it? muslin- ? can't remember, maybe $10? Total price: $275. Whew! Not cheap. 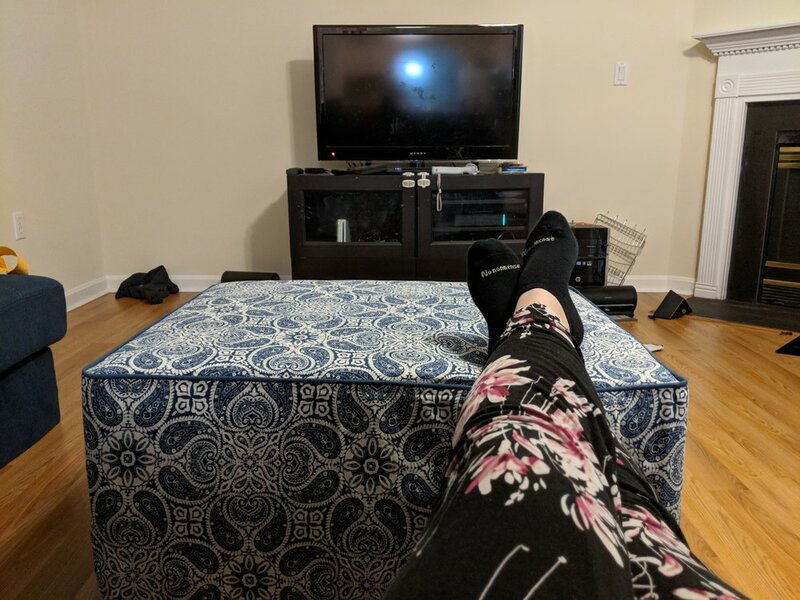 For reference, the matching ottoman we considered buying was $200 but had poor reviews. I feel like this will hold up well, plus it serves a dual purpose. I can't usually spend nearly this much on a sewing project, but I'm glad I was able to make this work out.